With Angelina Jolie's recent announcement that she had her ovaries and fallopian tubes removed because of both a BRCA 'gene defect' and a history of breast and ovarian cancer in her family, the idea that genes play a dominant role in determining biological destiny and cancer risk is proliferating in the mainstream media and popular consciousness uncontrollably like a cancer. "My doctors estimated that I had an 87 percent risk of breast cancer and a 50 percent risk of ovarian cancer, although the risk is different in the case of each." But where do these numbers come from? How did her caretakers arrive with any certainty at this figure? The reality is that the average woman's lifetime risk of ovarian cancer is exceedingly small, with the overall risk of developing ovarian cancer by 65 years of age being 0.8 percent and the lifetime risk 1.8 percent. For those with a first-degree relative developing ovarian cancer, as is the case for Jolie, the risk estimates show increases to 4.4 and 9.4 percent, respectively. It is also important to realize that lifetime ovarian cancer risk does not exist in a vacuum. Considering that it is not cancer (at any site) but heart disease that is the #1 killer of women, focusing on ovarian cancer risk as the primary threat to health is myopic at best, faulty reasoning with deadly consequences at worse. If Jolie had chose to go without radical surgical intervention, it is statistically more likely she would have died from heart-related death than cancer of any kind. The reality is that the lifetime risk of heart disease related death in women is in top position at 23.5%, according to CDC statistics, versus cancer which takes #2 position at 22.1%. And within cancer related deaths in women, breast, lung, colorectal cancer, uterine, thyroid, non-Hodgkin's lymphoma and melanomas are top on the list, with ovarian cancer in the 8th in position. Given this context, how Angelina's doctors can justify expressing the relative risk of 50% in a way that colloquially comes off as absolute risk, is a mystery. But even if her prognosticators are accurate at reading the 'tea leaves' of her genome and family history, their attempts at predicting the future reflect a profound misunderstanding of the ovarian cancer statistics as a whole, and the nature of cancer itself. First, ovarian cancer is highly overdiagnosed, i.e. 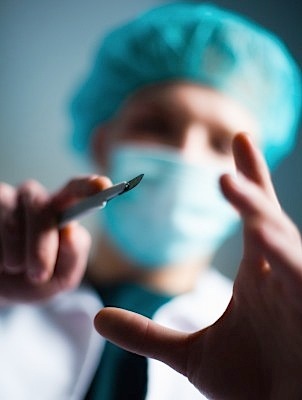 a labeling of "disease" that will never cause symptoms or death during a patient's lifetime. In other words, ovarian 'cancer' is being diagnosed in women whose ovarian abnormalities would never cause harm to them, and certainly never cause death before other more likely causes intervene! According to a JAMA retrospective study of ovarian cancer screening, five times more women without ovarian cancer end up having surgery than those with ovarian cancer. These are women who were told they had cancer and ended up having their ovaries removed – including subjecting themselves to other extremely toxic 'treatments' such as radiation and chemotherapy- because they put unfailing trust in their doctors and a medical system that claims to know far more about their bodies than they do. 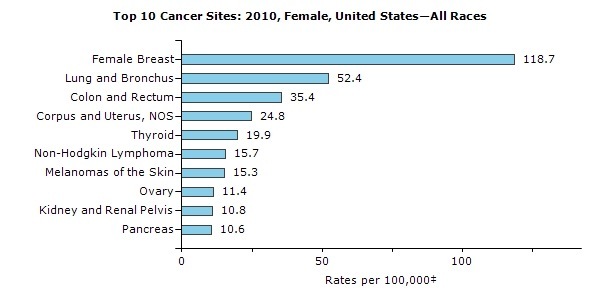 Not only does this overdiagnosis/overtreatment statistic represent an egregious assault upon women's physical and psychospiritual health, with unimaginable suffering as a consequence, but these false-positives inflate the ovarian cancer statistics, making it all the more likely to overestimate the prevalence and risk of ovarian cancer to the average woman in general. One of the fundamental reasons for ovarian cancer overdiagnosis is that the natural history of ovarian cancer, and age-associated non-cancerous ovarian changes that may be mistakenly interpreted as life-threatening cancers, has not yet been worked out. We are too busy diagnosing 'early stage' lesions and cutting, burning and poisoning these 'abnormalities' to know what they are. In the same way that so-called early stage breast cancers like ductal carcinoma in situ (DCIS), which for 30 years were treated as life-threatening and malignant – leading to 1.3 million US women having their breasts unnecessarily removed and their bodies treated with radiation and chemotherapy – were mistakenly classified as 'cancer,' non-malignant abnormalities of the ovaries that develop as women age are only now being understood as also benign and therefore better left untreated. "Borderline ovarian tumors comprise about 15%–20% of all epithelial ovarian malignancies [2, 3] with an incidence of 1.8–4.8 per 100,000 women per year [3–5]. BOTs differ significantly from ovarian carcinomas with regard to percentile distribution of tumor histotypes, lower FIGO stage, excellent overall prognosis, younger age distribution, higher infertility rate, and a lower frequency of BRCA mutations." Evidence for the non-malignancy of borderline ovarian tumors (BOTs) is reflected in the 5-year survival rate post-treatment, which is 95%–97% . This is on the same order magnitude as DCIS, which is as high as a 10-year survival rate of 96%-98%. Why so high a survival rate? Because the women diagnosed with the condition and subsequently treated are not surviving 'cancer,' rather, unnecessary surgery, treatment and the psychological traumas that follow the process. "Borderline ovarian tumors represent a wide spectrum of tumors with different biological potential and uncertain malignant potential. No precise prognostic or predictive markers exist to clearly distinguish between tumors of purely benign behavior and those with risk of malignant transformation into carcinomas. Therefore, the oncologic safety must be always balanced again less radical treatment." The primary justification today for preemptive ovary and fallopian tube removal -- salpingo-oophorectomy -- is the notion that hereditary determines risk. Family history, for instance, is considered the primary factor in determining whether a woman will end up with ovarian cancer. In other words, if your mother had ovarian cancer, it is believed you will be far more likely to end up with it as well. The BRCA genes – BRCA1 and BRCA2 -- have been identified as the primary 'cause' for this familial association, in an unsophisticated nod to genetic determinism that has been the prevailing theory for over half a decade. But the reality is that if your mother had been diagnosed with ovarian cancer (perhaps falsely), you are more likely to share a similar set of environmental exposures, dietary incompatibilities and emotional patterns that feed into physiological/immunological factors directly related to ovarian cancer risk. These women are also much more likely to seek out medical surveillance for the condition, and are therefore much more susceptible to overdiagnosis and overtreatment yourself, repeating the vicious cycle of iatrogenesis. This is generally not considered when family history related ovarian cancer risk is calculated. And this has everything to do with the medical establishment not coming clean as to its increasingly obvious mistakes. But there is also a far more insidious aspect to the hereditary-based theory of ovarian cancer risk that is not on the radar of most oncologists, and is certainly not something the mainstream media has reported on. 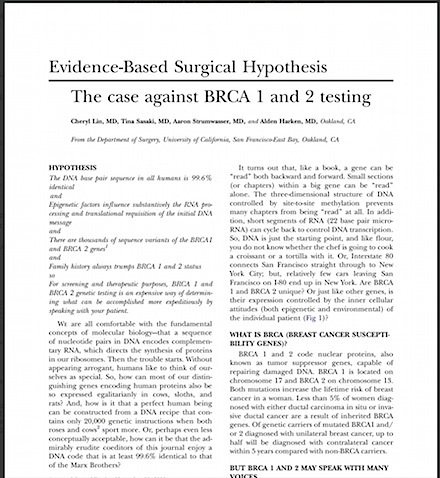 The reality is that BRCA mutation status is not nearly as important as epigenetic exposures – chemicals, nutrient deficiencies and incompatibilities and even emotions – which can 'knock out' the cancer-protective function of the BRCA genes, regardless of whether one was born with 'defective' or 'healthy' version of the gene from the start. Improved survival in women with BRCA-associated ovarian carcinoma. "BRCA1 heterozygotes developed EOC [epithelial ovarian cancer] at a younger age compared with BRCA2 heterozygotes and women who had sporadic ovarian carcinoma. BRCA heterozygotes had a better response to platinum chemotherapy compared with women who had sporadic disease, which may have contributed to their improved prognosis." Clinicopathologic features of BRCA-linked and sporadic ovarian cancer. "Although BRCA-associated hereditary ovarian cancers in this population have surgical and pathological characteristics similar to those of sporadic cancers, advanced-stage hereditary cancer patients survive longer than nonhereditary cancer patients. Age penetrance is greater for BRCA1-linked than for BRCA2-linked cancers in this population. "BRCAness" syndrome in ovarian cancer: a case-control study describing the clinical features and outcome of patients with epithelial ovarian cancer associated with BRCA1 and BRCA2 mutations." "Compared with controls, BRCA-positive patients had higher overall (95.5% v 59.1%; P = .002) and complete response rates (81.8% v 43.2%; P = .004) to first line treatment, higher responses to second and third line platinum-based chemotherapy (second line, 91.7% v 40.9% [P = .004]; third line, 100% v 14.3% [P = .005]) and longer TFIs. [treatment-free interval]." A game-changing recent study published in the journal Tumor Biology titled, "BRCA1 promoter hypermethylation and protein expression in ovarian carcinoma – an Indian study ," casts serious doubts upon the primary role that the much touted BRCA mutation status has in determining both ovarian cancer risk and treatment outcomes. BRCA stands for Breast Cancer Susceptibility Gene, and is responsible for producing a protein – BRCA – that suppresses tumors, both of the breast and ovaries. The new study found that epigenetic silencing of the BRCA1 promoter gene – through a process known as gene hypermethylation -- is a common phenomenon in ovarian cancers, affecting about 1 in every 2 ovarian cancers studied. Up until now, most of the focus on breast and ovarian cancer risk has been on the inherited BRCA1 mutations and how they interfere with proper BRCA function. The new study reveals that epigenetic processes, working from the outside in, as it were, can produce the same functional outcome as an inherited mutation. BRCA gene deactivation through hypermethylation can be stimulated through chemical exposures, such as to dioxins, for instance. There is also research indicating this can be prevented through natural compounds such as resveratrol and soy, putting diet – and so-called nutrigenomic interventions – at the forefront of cancer prevention and treatment. We explored the role of 'phytocompounds' in protecting against BRCA silencing (hypermethylation) with nutritional compounds in-depth in a previous article titled, "Beyond the 'Breast Cancer" Gene (BRCA): Why Food Is Your Medicine ," wherein resveratrol is identified to suppress the persistent environmental pollutant 2,3,7,8 tetrachlorodibenzo-p-dioxin (TCDD) induced silencing of BRCA. The fact remains that everyone, man and woman, has the BRCA1 and 2 gene. And everyone faces the risk of chemical exposure with tens of thousands of carcinogens that now exist freely in our environment, food, and body care products. The aforementioned study speaks to how important our choices, our exposures, our diet, affect our cancer risk, and more specifically our gene expression, and whether the patterns of expression will promote health or interfere with it. The concept – the meme – that hereditary determines one's biological destiny is archaic. After the first draft of the human genome project was completed in 2005, they only found 23,000 genes! That's not enough protein-coding genes to explain the existence of our body, which contains at least 100,000 different proteins. What this epic failure revealed is that it is not the genes themselves that determine health or disease, rather, what factors in our environment, lifestyle and nutrition that activate the expression of certain genes, and silence the expression of others. In the case of BRCA1 and BRCA2, we now know that silencing these genes from the 'outside in' results in the same result as being born with a defective gene from the 'inside out,' with the important difference that epigenetic – 'outside in' – gene silencing can actually be reversed or mitigated. Our genome results from millions of years of evolution, whereas our epigenome is influenced by day to day decisions, many of which depend on what we decide to eat or avoid eating, right now. Choice, therefore, becomes central to determining disease risk. And given that Jolie's decision to remove her breasts, and subsequently her ovaries, was predicated on a belief that she is helpless in the face of predetermined risk – her decision does not reflect the evidence and biological science itself. How do we end up living in a world where people believe that their genes – which they do not have access to without biomedical surveillance -- determine their destiny? How we end up thinking that 'gene defects' are so powerful that removing healthy organs from our body is the only reasonable way to prevent experiencing cancer within them? If we take this logic to its fullest expression, why wouldn't someone determined to have a greatly increased risk of brain cancer remove their head prophylactically? The same twisted logic applies to ovarian and breast cancer. Remove your ovaries and breasts, and what chance do you have of contracting cancer within them in the future? That's the illogical logic operative here. We must recognize cancer, not as a time-bomb programmed to go off, but as the expression of a hostile environment in the body that cells are attempting to adapt to. This is a meme of empowerment, of true prevention, and one that delivers the imperative to clean up our planet, our bodies, and our minds. Related article: Pinkwashing Hell: Breast Removal as a Form of "Prevention "
 Hartge P, Whittemore AS, Itnyre J, McGowan L, Cramer D. Rates and risks of ovarian cancer in subgroups of white women in the United States. The Collaborative Ovarian Cancer Group . Obstet Gynecol. 1994 Nov;84(5):760-4. PubMed PMID: 7936508. 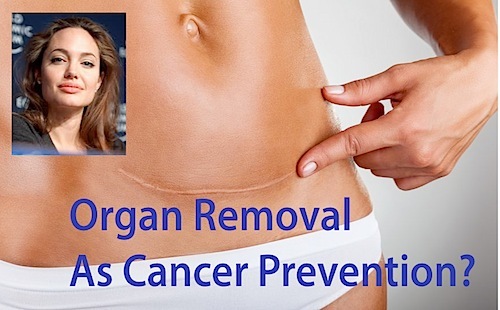 Listed below are links to blogs that reference this entry: Beware of Organ Removal for "Cancer Prevention": Jolie's Precautionary Tale. This page contains a single entry by Toni published on March 26, 2015 1:11 PM. Researchers: Delay Breastfeeding to "Improve" Vaccination? was the previous entry in this blog. The City of San Diego is Suing Monsanto is the next entry in this blog.